The next flash sale of the KaiOS-powered JioPhone 2 kicks off at 12:00 PM tomorrow from Jio’s official website. 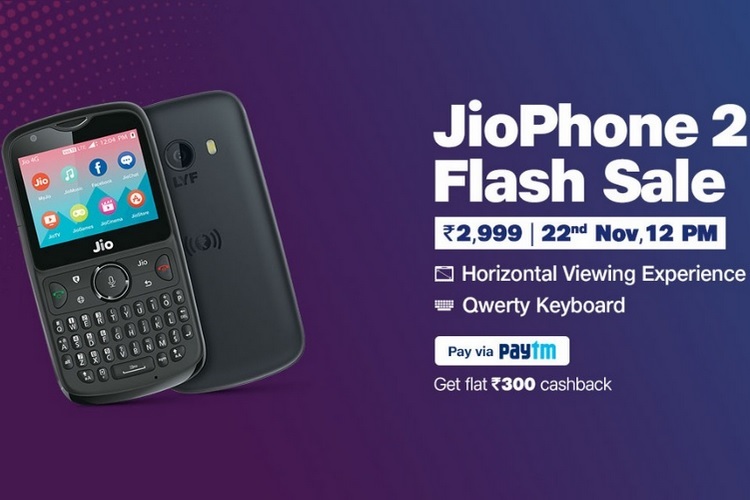 If you were unable to buy the second generation JioPhone in its previous flash sale, clear your schedule. Reliance is also offering a cashback of Rs. 300 if you pay for the device via Paytm, bringing the effective price of the JioPhone 2 down to just Rs. 2,699. Priced at Rs. 2,999, the JioPhone 2 features a QWERTY keypad and borrows its predecessor’s 4-way navigation key and the dedicated voice command button to summon the Hello Jio assistant. The device features a 2.4-inch QVGA display (320×240 pixels) and comes with 512MB of RAM paired with 4GB of internal storage that can be expanded by up to 128GB via a microSD card. The JioPhone 2 packs a 2MP camera on the back and a 0.3MP front camera for selfies. The device runs KaiOS, supports FM radio and comes equipped with a 2,000mAh battery. It also offers native support for 24 Indian languages and comes preloaded with WhatsApp, Facebook and YouTube. Connectivity options on the JioPhone 2 include Wi-Fi, GPS and Bluetooth, but it also comes with an NFC chip. Cellular connectivity includes support for VoLTE, as well as LTE Cat4 (150 Mbps download, 50 Mbps upload) on Band 2, 5 and 40. It also supports 2G on 900 and 1,800MHz frequencies. If you are in doubt whether the JioPhone 2 is worth the money, you can check out our hands-on impression of the device and also read our comparison pitting the JioPhone 2 against the original JioPhone to decide if it is worth the upgrade.